Eurotrek survived a mistake at the second last and almost going off the course by bearing left under winning rider Liam Heard at the Elbow to spring a surprise 25-1 success in the £100,000 totesport.com Becher Handicap Chase. 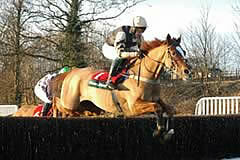 Winning trainer Paul Nicholls said: "Eurotrek jumped brilliantly, although Liam lost his way jumping the last. "It was a last minute decision to run and I thought that he might need the run, but saying that I don't think that I have ever seen him looking so well as before the race. "The John Smith's Grand National would have to be the target now - he won't run in the Hennessy - and as he goes so well fresh, I wouldn't be worried going straight there and Liam gave him a great ride. "This was a big surprise and I said to Paul [Green, owner] that the Hennessy was not ideal and we would see how we go here ahead of the National and he jumped around like that! "If he does run before the National, it won't be until the weights are published as he is high enough in the weights anyway. You can see how well he's run fresh." The winner received a 12-1 quote for the John Smith's Grand National from totesport, while Blue Square and Hills are more generous at 16-1 and Ladbrokes go 20-1. Liam Heard made light of his erratic path at the Elbow. The winning jockey said: "I was driving the horse and then I looked up, but there was no panic as I was far enough away and I had enough space and plenty of time to adjust and it was no problem. I would probably have got sacked if I'd mucked up! "This is just my second ride over the National fences and at the third last, he just sprinted and quickened up so well. When Paddy [Brennan, rider] started sprinting on Bewleys Berry, my horse went with him. "Hopefully, I'll keep the ride in the National and you won't get a better ride than this horse in the race - he kept pulling away and pulling away. "He normally wants really soft ground and I didn't think that the ground was as soft as he would have liked. "At the second last, I asked him to go a bit too long but he was too clever and got me out of trouble." The connections of Bewleys Berry and Dunbrody Millar were left dreaming of glory in the John Smith’s Grand National next April after the duo finished second and third respectively behind Eurotrek in the £100,000 totesport.com Becher Chase. Bewleys Berry was beaten eight lengths in second and his owner Graham Wylie said: “He has jumped really well and Paddy (Brennan, jockey) said the horse loved it and really enjoyed himself out there today. “I will have to have a chat with Howard (Johnson, owner) but you would like to think we might have a National horse. “He was never quite on song last season but is in much better form this season. Bill Dundon, of the Dundon Else Partnership, was also hoping he might have a live John Smith’s Grand National on his hands after Dunbrody Millar finished a further length back in third. Dundon said: “He ran well for a long way and then stayed on again at the finish - I think that’s his new style of racing! Before he would drop out and then chuck it in but he was staying on again today. “I think these Lord Americos improve between the ages of 10 and 18 and he jumped well today. I am pleased for Seamus (Durack, jockey) as he deserved this and like me hails from Limerick. “Dunbrody Millar was back to form today but to be fair he has gone up a lot in the handicap. “He only really has the one-pace but Iwould like to think he’s a National horse. He would need to go up a few pounds to make the cut. After the totesport.com Becher Chase, Marcus Foley, rider of Solar System, was taken to the Fazackerly Hospital as precautionary measure after the horse rolled on him and he suffered a suspected wrist injury. while Nina Carberry who is not in a serious condition after being unseated at Becher’s. All horses are reported to have come back fine from both races over the Grand National fences.